The Association of Geotechnical & Geoenvironmental Specialists (AGS) has produced new guidance for the description of made ground. The description of anthropogenic materials, made ground, or “fill” is not particularly well covered by existing standards, which leads to the lack of a common approach amongst ground engineers. This inconsistency could potentially lead to important indicators of contamination or gassing potential being overlooked, or not sufficiently clearly conveyed to other stakeholders. The new approach is summarised in a flow chart, which has been produced to allow it to be laminated and taken to site to act as an aide memoire for those who encounter and have to describe these “soils”. The new guidance is available from AGS (https://www.ags.org.uk/item/description-of-anthropogenic-materials-a-practitioners-guide/). 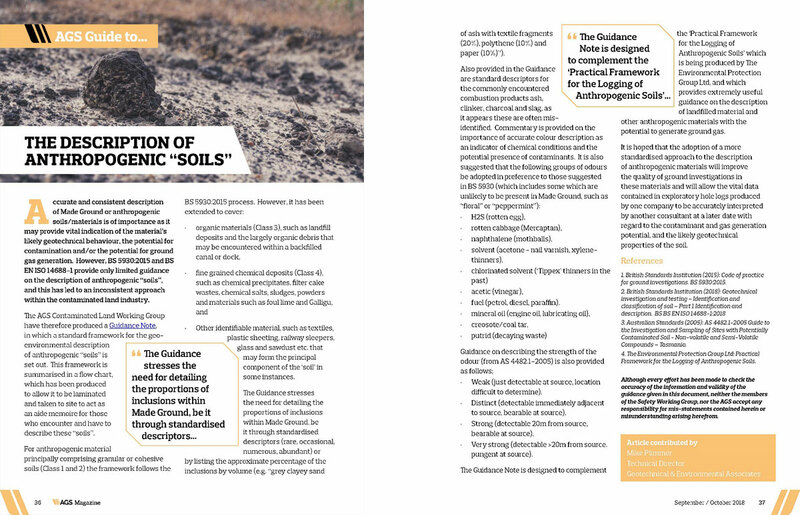 GEA Technical Director Mike Plimmer is a member of the AGS Contaminated Land Working Group that developed the new guidance and in the latest issue of September/October edition of the AGS Magazine Mike introduces the new guidance. He also provide some very useful tips on identifying different odours that might be encountered in shallow contaminated soils. In mid-2104 Wildgoose Construction asked GEA to review the findings of three previous phases of investigation at a site in Runcorn adjacent to the Bridgewater Canal, where significant contaminated land issues had been identified. The biggest problem with groundwater, particularly in the sort of mixed soils that characterise much of the southern half of the UK, is how difficult it is to determine where it is in the ground. This, of course is not really what the client wants to hear. Buried Services – A Ground Investigation Problem? You arrive on site with detailed plans of the buried services. The electricity and telecommunications can be readily confirmed with your Cable Avoidance Tool (CAT); the route of the gas main, sewer and water main are visually located through pavement scarring and covers.